This week features PI Day, which as we all know is March 14, using the U.S. system of calendar date nomenclature. In fact, this year is 3/14/15, which is pi to 4 decimal places (3.1415). So, let’s look at some of the more well-known uses of the number pi in science fiction and fantasy. 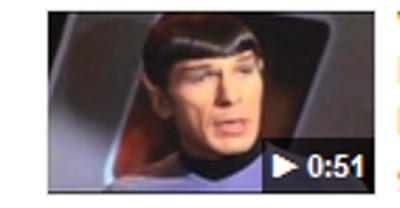 Star Trek – Spock’s instructions to a wayward computer: calculate pi to the last digit. Given Leonard Nimoy’s recent death, this reference to Spock should definitely should get first mention. "Computer, this is a Class A compulsory directive. Compute to the last digit, the value of pi." In this case, Spock wanted to tie up a dangerous entity, temporarily housed in the Enterprise computer system by keeping it busy (potentially forever): as Spock later explained, "the value of pi is a transcendental figure without resolution". The fact that pi is infinite and non-repeating is something we are all taught in grade school, but Spock says it so eloquently, that it seems fresh and remarkable. Contact, Carl Sagan – message from aliens encoded in value of pi. This is a great movie, based on a great book by a great astrophysicist and science popularizer, Carl Sagan. It has several interesting mathematical references (a dodecahedron and pi – what could be more awesome?). Here are a few snippets from the Wiki about the movie. The participants reach a consensus that the (wormhole travel) machine is a dodecahedron shaped vehicle with five seats. He also tells her that the wormholes were built by still more advanced beings who have left messages in transcendental numbers like π.
Ellie works on a program to compute the digits of π to record lengths in different bases…When Ellie looks at what the computer has found, she sees a circle rasterized from 0s and 1s that appear after 1020 places in the base 11 representation of π. This gives her a way to convince the world of something greater – that intelligence is built into the universe itself. Sagan's friend, the physicist Kip Thorne, gave Sagan guidance about the nature of wormholes when Sagan was developing the outline of the novel. As it happens, I am reading a book by Kip Thorne at the moment, about Black Holes (Black Holes and Time Warps: Einstein’s Outrageous Legacy) . In that book he notes that beings who lived in a very intense gravitational field (if that were possible) would not measure the ratio of the circumference of a circle to the diameter of a circle to be 3.14159 as we do. Thorne, Kip (1995-01-17). Black Holes & Time Warps: Einstein's Outrageous Legacy (Commonwealth Fund Book Program) (p. 130). W. W. Norton & Company. Kindle Edition. Euler himself referred to these as “theorems about the reduction of integral formulas to the quadrature of circles”. What’s this got to do with circles?, it is natural to ask. At any rate, it is interesting to speculate what creatures who lived in a space where Circumference/Radius <> 3.14159… would make of this. Would pi seem even more mysterious to them than it does to us, once stripped of its familiar geometrical trappings? Or maybe they would just shrug and say “whatever, another transcendental number” (it turns out that most numbers are transcendental, though we only actually know the value of a few of those). Mind you, part of pi’s fascination for us may be that we first learn of it in elementary school, in association with simple geometry, and yet it continually shows up at the highest post-graduate levels of pure math, which generally exceeds the comprehension of most of us. So obvious and yet so difficult. As for messages and pi, naturally all possible messages are embedded in pi, since it is infinite and non-repeating. Yet, no matter how profound those messages, they are really just a working out of a few of the infinite possibilities produced by a random process. Or at least that’s what we assume. Perhaps we would change our minds on that if we do find a really significant-seeming message in the “near-zero” range of some expansion of pi. Here’s another one that makes use of the idea that a message is embedded in the expansion of the number pi. The story is about a family which finds an alien artifact on a beach while on vacation: a smooth cone with patterns of stripes on its surface and which produces sound in the same pattern. It turns out to be like a portable hard-drive which contains an enormous amount of information, including details about the alien civilization ("Leutians, from Bernard Star"), a solution to Riemann Hypothesis and "answers to virtually every mathematical puzzle which we have ever proposed". The pattern of stripes turns out to be the decimal expansion of pi, hence the punning title of the story of pi being in/from the sky (it is not clear why the Leuticians would use base 10 for encoding). The Riemann Hypothesis has to do with something called the zeta function, and its non-trivial zeros. It has connections with the distribution of prime numbers and a lot of other mind-blowingly difficult issues in pure math. Rudy Rucker has written a lot of interesting stuff, if you like to speculate about the deeper meanings of mathematics (e.g. Infinity and the Mind, which I really should re-read).